3. Display - 6.1" Dynamic AMOLED display with a WQHD+ resolution, brightness, contrast, color temperature, sRGB coverage, etc. Samsung celebrated the 10th anniversary of its Galaxy S series in a way that only Samsung can - with vigour and style, proving once again that the company's focus is to bring meaningful innovations. The Korean giant introduced not two but five new smartphones at its Samsung Unpacked event on February 20th. Of course, along with the Galaxy Fold, the Galaxy S10 and S10+ were the show's pinpoints. They introduce a number of new and improved features coupled with a perfectly refined design and form factor. The Galaxy S10 series brings advanced triple rear cameras with an ultra-wide unit, ultrasonic in-display fingerprint sensors, big and unbeatably bright Infinity-O displays, Wireless PowerShare for charging wirelessly other devices, and of course - the latest and best system-on-chips. So, here's our in-depth review of the Galaxy S10 bringing lots of design photos, display measurements, battery tests, performance benchmarks, camera sample photos and videos, audio test, etc. 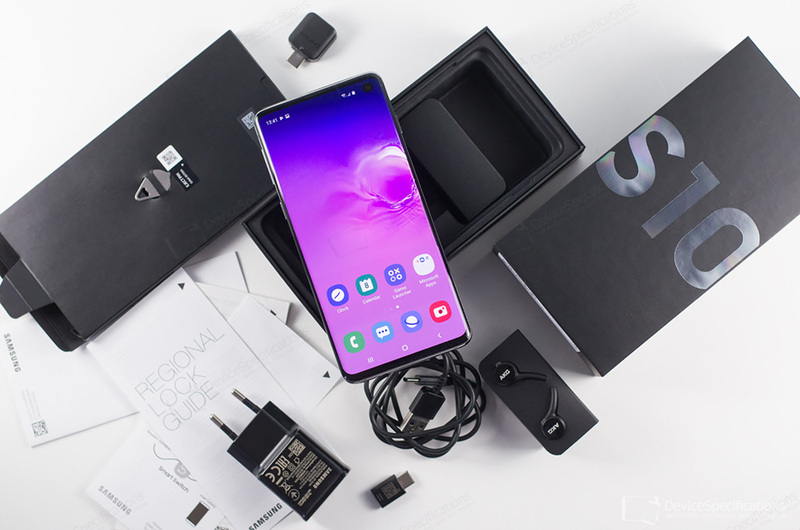 Get a Samsung Galaxy S10 Duos or Galaxy S10+ Duos (Exynos and Snapdragon versions available) at a promotional price from Etoren.com. Tax/duties are included for selected countries. Samsung Galaxy S10 (SM-G973F) evolves around a 6.1-inch Dynamic AMOLED display with a WQHD+ resolution which translates to 1440 x 3040 pixels. The manufacturer specifies a 550 ppi pixel density and 19:9 aspect ratio. The display has the light and proximity sensors placed under it as well as an ultrasonic fingerprint sensor also placed under it. The front-facing camera is housed in an O-shaped punch hole in the top corner of the display. 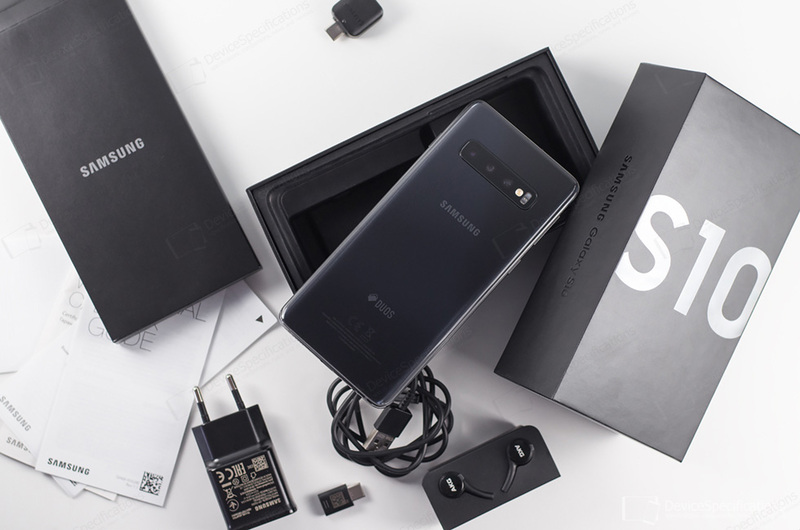 The front is protected by a 3D curved Corning Gorilla Glass 6, the back features a Corning Gorilla Glass 5 panel, while the middle of the "sandwich" consists of an aluminium alloy chassis and a polished aluminium alloy frame. Under the hood, there's a 3400 mAh battery combined with a 5V/2A~9V/1.67A fast charger. The model supports not only 15W Qi/PMA wireless charging but also 9W wireless reverse charging. Samsung Galaxy S10 has two variants in terms of the system-in-chip it uses. The Qualcomm Snapdragon 855 units are reserved mainly for the US market, while Europe and the rest of the world get the Samsung Exynos 9820 version. Snapdragon 855 houses a tri-cluster Kryo 485 CPU with a single 2.84GHz Prime core, 3x 2.42GHz Performance cores and 4x 1.8GHz Efficiency cores. There's an Adreno 640 GPU clocked at 720MHz with Vulkan 1.1 support that handles the graphics. Exynos 9820 has a tri-cluster CPU architecture as well, including 2x Custom CPU (4th gen) cores + 2x Cortex-A75 + 4x Cortex-A55 cores and a 12-core Mali G76 MP12 GPU. All Galaxy S10 versions arrive with 8GB of LPDDR4X double-channel RAM and 128GB of UFS 2.1 storage as base capacity. 512GB variants are available as well and storage can be expanded with a microSD card. The list of supported by the model network bands includes 2G GSM (800, 900, 1800, 1900 MHz), 3G TD-SCDMA (1880-1920, 2010-2025 MHz), 3G UMTS (850, 900, 1700/2100, 1900, 2100 MHz), 4G LTE-FDD (700 Class 13, 700 Class 17, 800, 850, 900, 1700/2100, 1800, 1900, 2100, 2600 MHz), and 4G LTE-TDD (1900, 2300, 2500, 2600, 700 MHz - B12, 700 MHz - B28). LTE speeds are Cat. 20 ones. The device also supports Wi-Fi Hotspot, Wi-Fi Direct, dual-band Wi-Fi 802.11 a/b/g/n/ac with 4x4 VHT80 MU-MiMO, 1024-QAM scheme, Bluetooth 5, NFC with Android Beam and Tap & Pay. The Galaxy S10 works with GPS, GLONASS, BeiDou, and Galileo. The device has a USB Type-C 3.1 port with OTG support and a 3.5 mm jack. The camera module on the back of the S10 packs a total of three units. The first shooter is equipped with a 13MP Samsung S5K3M3 sensor (1.0μm pixel size) and a telephoto 45-degree lens with an f/2.4 aperture. This camera is optically stabilized and aided by PDAF. It supports up to 0.5x out and 2x in optical zoom and up to 10x digital zoom. The second shooter is a 12MP Samsung SAK2L4 wide-angle one with a 77-degree lens which has a variable aperture (either f/1.5 or f/2.4). It is aided by OIS as well as Dual Pixel AF. The third unit packs a 16MP Samsung S5K3P9 sensor and an ultra-wide lens with a 120-degree field of view and an f/2.2 aperture. The sensor has a 1.0μm pixel size. The camera module on the back is complemented by the heart rate and blood oxygen level scanner. Finally, the front camera features a 10MP Samsung S5K3J1 sensor with an 80° wide-angle lens with an f/1.9 aperture. Samsung Galaxy S10 runs on Android 9 Pie with One UI 1.1 on top. Complete Samsung Galaxy S10 Exynos and Samsung Galaxy S10 SD855 specifications.